The chirping birds and blossoming crocuses means Spring must be right around the corner. Actually, it’s Tuesday to be exact. I must say it’s been tempting these last few weeks to get outside and start playing in the dirt. Alas, it’s still a little early to go planting like crazy. However, it’s the perfect time to start my seeds - indoors. Every year once I receive my seed order in I sit down and, using old-fashioned paper and pencil, create a seed starting calendar. First, I sort my seed packets into piles based on how long that particular thing needs to grow before going in the ground. For instance, my pepper seeds need to be started 8 to 10 weeks before going into the garden. 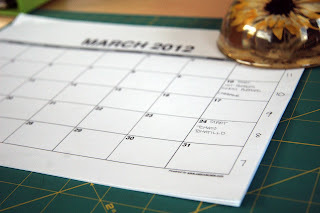 Second, on my blank paper calendar, I count backwards in one-week increments from the last frost date (around May 14th in my zip code) and label each week with the week number and write on the Saturday of that week which seeds I need to start that week. Also, it’s important to mark down which seeds can be directly sown into the garden and when. I can direct sow something like kale up to two weeks before the last frost date but I can’t direct sow beans until at least a week after the last frost date. I know it sounds a little OCD to do all this prep work, but trust me a little planning goes a long way. 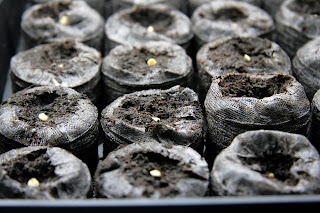 I use a variety of seed starting methods from Jiffy brand kits, to Burpee brand kits to Gardener’s Supply kits to cow pots and recycled egg cartons filled with organic seed starting mix. They have all worked pretty well for me. The key is starting things like tomatoes and squashes in larger sized things. So, peppers were the first things on my calendar to get started. I usually plant two of every variety, which means I’ll start at least 4 or more seeds of each variety. This increases my chances of having at least two healthy seedlings by the time May rolls around. This year I’m planning to grow three hot varieties and three sweet varieties: Chocolate Habanero, Cayenne, Chinese 5 Color, California Wonder, Jimmy Nardello and Sweet Antigua. Next weekend it’s on to tomatoes and tomatillos. Happy Spring everyone and happy seed starting! Feel free to share your seed starting tips.